High quality doesn�t have to mean expensive! Many of the clearance tableware items here at Mrs. Lin�s Kitchen are some of the most beautiful and functional pieces that you will ever find. Whether you are looking for to-go bento boxes or high-quality ceramic plate sets, the clearance tableware items that you find here will shock you with their affordable prices! Looking for a useful and practical lunchbox to bring to school or work? 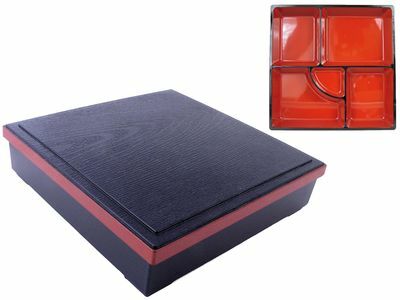 Many of our bento boxes, like the Blooming Cherry Blossoms Red Stackable Japanese Lacquer Box, are made from quality lacquered plastic and have many compartments for a perfectly packed meal! Complete with an insulated lunch bag, your to-go lunches will be set for years to come! You won�t be able to find high-quality plates and bowls at such unbeatable prices anywhere else! Many of the plates, bowls, and dishes here at Mrs. Lin�s Kitchen are beautiful, affordable, and astonishingly high-quality. Any pieces of tableware that you find in this clearance tableware section are sure to be an amazing deal, like the Peach Cherry Blossom Serving Bowl Set, which will be a meaningful and long-lasting addition to your dining table. Don�t miss out on these wonderful deals-- order high-quality tableware for your home today!